Fast Raw File Copier Pro easily allows you to copy files while showing progress percentages as well as the ability to copy files which generally cannot be copied through traditional means in the Windows OS. 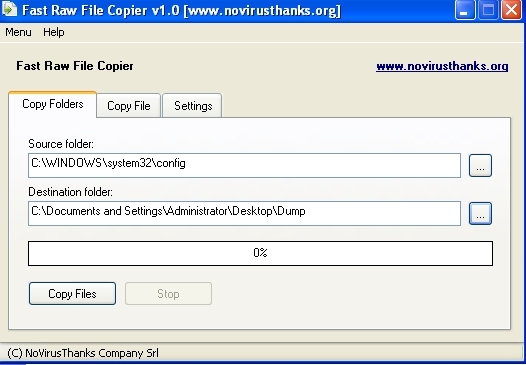 An example of a file which cannot be copied due to built-in Windows OS protection is the SAM file which contains user password hashes, this file is no problem for Fast Raw File Copier Pro nor is other protected files alike. What is SAM file ? I am going to use Fast Raw File Copier Pro to dump the entire content of the protected directory C:\WINDOWS\system32\config\ that contain sensitive files, such as SAM file and registry files. Read more about Fast Raw File Copier Pro. Posted by admin on Thursday, December 29th, 2011 at 9:09 pm	and filed under Security News with tags copy SAM file, copy system32 config folder, dump SAM file, raw copy file, windows xp sam file. You can skip to the end and leave a response. Pinging is currently not allowed.